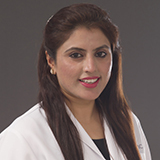 As a specialist Gynaecologists, she has worked in Rasheed Hospital, Defence Lahore, Pakistan. She had performed more than 3,000 caesarean sections, caesarean hysterectomies, total abdominal hysterectomies, laparotomies and many perineal surgeries. She specializes in managing normal and high risk pregnancies. She has a total of 10 years of experience as Specialist in Obstetrics and Gynaecology and vast experience in operative gynaecology. Dr. Asma speaks Urdu, Hindi and English languages.